A while back I mistakenly subjected myself to to some painful watching of nonsense by the BBC about the Shroud of Turin, in order to properly purge it from my system and do something slightly productive with it I decided to make a quick post on this blog about it.
. . . Most of his "corrections" were based on nonsense that I already knew but long since discounted. Some Shroud people in order to "come to terms" with the radiocarbon dating, discount the dating by suggesting it was taken from the wrong place. I already knew that and found it utterly silly. “I already knew that and found it utterly silly.” That is unquestionably fundamentalist talk; atheist fundamentalist talk — ignore the science. The Shroud of Turin was carbon dated in 1988. The conclusion of those tests was that the cloth originated between 1260 and 1390. However, tests recently conducted at the Los Alamos National Laboratory by a team of nine scientists under the direction of Robert Villarreal confirm what chemist Raymond Rogers found and published in a peer-reviewed scientific journal, Thermochimica Acta (Jan. 2005): The tested sample was not representative of the shroud’s cloth. Rogers’ findings had also been confirmed by Georgia Tech’s materials forensic chemist John L. Brown. Even the Christopher Ramsey of the Oxford Radiocarbon Dating Laboratory, which participated in the original tests, has concluded the needs for new studies. Not Ssnot, he knows better than scientists. A scientist will acknowledge that we might not have all the answers. A fundamentalist ignores such caution. A trinity of priests praying for a miracle? These three priests clutching the Turin Shroud are none other than the three favourites for Westminster, Archbishops Vincent Nichols and Peter Smith, and Bishop Malcolm McMahon, from Birmingham, Cardiff and Nottingham.
. . . Which one of the three will the Shroud favour? Sadly, perhaps, none, as the shroud pictured here is a replica, albeit one of just six in the world, currently on display at an exhibition in Birmingham. Read the full report at Times online faith by the spokesman for the Newman Cause, Peter Jennings. Nicholas Allen continues to push his theory (it has been demonstrated in many ways that the image cannot be a photograph). AN international television documentary on the controversial Shroud of Turin, which has just been completed, features the work of a Nelson Mandela Bay academic who has been researching the ancient relic for more than a decade. The Shroud is purported to be the cloth in which the body of Jesus Christ was buried. 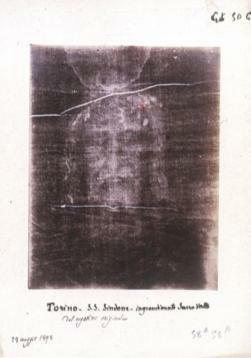 Professor Nicholas Allen‘s research resulted in a book in which he explained how the shroud, which appears to carry the imprinted form of Christ, was actually “the first photograph”. Pioneer Studios from Hammersmith in London filmed the documentary on the mystery behind one of the Catholic Church‘s most important relics, and it will be aired by the Discovery Channel. The Shroud of Turin was proved to be a 13th or 14th century forgery by carbon dating techniques in 1988 – but that scientific conclusion hasn‘t altogether dispelled the firm belief among many Christians that it is a holy relic. Allen, formerly dean of the faculty of arts and design at the then Port Elizabeth Technikon, is a sculptor and art historian. “The documentary is intended to offer a more balanced appraisal of the Shroud‘s import. Apparently another recent documentary was aired in the USA and gave the impression that the shroud was a miracle, so the Discovery Channel decided to commission Pioneer Studios to make a more objective documentary to counter this,” said Allen. A number of researchers and historians were interviewed for the documentary, mostly Americans. Allen started his research on the Shroud of Turin out of a passion for history and out of curiosity. He said he chose his avenue of research because “nobody was looking at how a forgery was made. I started to find out how they did it. “I started to look at it as a phenomenon and the obvious conclusion it was a photograph. Allen‘s research was published as a thesis, and later in 1998, he published a book The Turin Shroud and the Crystal Lens: Testament to a Lost Technology. Allen believes the Shroud of Turin is physical evidence that people understood at least the rudiments of primitive photography about five centuries before its accepted discovery in 1799 by Thomas Wedgewood. In 1988, carbon dating was done by three institutions which came up with exactly the same conclusion that the linen of the shroud was grown between 1260 and 1390. 1) will be published online ahead of print publication. Actually that was published by the Journal of Optics of the Institute of Physics in London, on April 14, 2004. 2) The shroud has been kept rolled up in a silver casket and has been on display only five times in the past century. Actually, it is no longer kept rolled up or in a silver casket. It it stored flat in an inert gas, temperature controlled, fire proof chamber. 3) The next display will be in 2025. Actually that has been changed to 2010. The ghostly image of a man’s face has emerged on the reverse side of the Shroud of Turin, the piece of linen believed to have been wrapped around the body of Jesus after he was crucified, scientists say. The discovery, using new digital imaging techniques, adds new complexity to one of the most controversial relics in Christendom. The study, which will be published online ahead of print publication in the Journal of Optics A: Pure and Applied Optics, examined the back surface of the famous handwoven linen. The front side of the shroud, which carries the smudged outline of the body of a man, has been venerated as proof that Christ was resurrected from the grave, yet dismissed by others as a brilliant medieval fake. While a multitude of scientists have investigated the front side of the shroud, the back side has remained hidden for centuries beneath a piece of so-called Holland cloth. Nuns had sewn on the cloth in 1534 to protect the shroud after it had been damaged by fire. And researchers only fully scrutinised the cloth’s back surface in 2002, when the 14-foot-long linen was unstitched from the Holland cloth during a restoration project. To the naked eye, the back surface of the shroud showed almost nothing, apart from a peculiar stitching that Dr Mechtild Flury-Lemberg, the Swiss textile expert who performed the restoration work, identified as a style seen in the first century AD or before. The back surface, however, was photographed in detail and the pictures published in a book by Monsignor Giuseppe Ghiberti, one of the Church’s top shroud officials. At the end of the restoration, a new reinforcing cloth was sewn back in place, hiding the shroud’s reverse side once more. "As I saw the pictures in the book, I was caught by the perception of a faint image on the back surface of the shroud. I thought that perhaps there was much more that wasn’t visible to the naked eye," said Giulio Fanti, professor of mechanical and thermic measurements at the University of Padua and the study’s lead author. Fanti used sophisticated image processing based on direct and inverse Fourier transform, enhancement and template-matching techniques on Ghiberti’s pictures to uncover the image of a man’s face. Lying behind the known image of the bearded man bearing the marks of crucifixion, the new image had a striking 3-D quality and matched the known face in form, size and position. "Though the image is very faint, features such as nose, eyes, hair, beard and moustache are clearly visible. There are some slight differences with the known face. For example, the nose on the reverse side shows the same extension of both nostrils, unlike the front side, in which the right nostril is less evident," Fanti said. But the enhancing procedure did not uncover the full body image as it appeared on the front side. "If it does exist, it is masked by the noise of the digital image itself. But we found what it is probably the image of the hands," Fanti said. The presence of a face on both sides of the shroud would seem an obvious feature in case of a fake: when making a print onto a cloth, paint soaks the cloth’s fibres and also reaches the back side. "This is not the case of the shroud. On both sides, the face image is superficial, involving only the outermost linen fibres. When a cross-section of the fabric is made, one extremely superficial image appears above and one below, but there is nothing in the middle. It is extremely difficult to make a fake with these features," Fanti said. Scientific interest in linen cloth began in 1898, when lawyer Secondo Pia photographed it. The negatives showed the image of a bearded man with pierced wrists and feet, and a bloodstained head. In 1988, the Vatican approved carbon-dating tests. Three laboratories in Oxford, Zurich and Tucson, Arizona, concluded the shroud was medieval, dating from 1260 to 1390, and not a burial cloth wrapped around the body of Christ. But since then a growing sense that the radiocarbon dating might have had substantial flaws has emerged among shroud scholars. Fanti’s finding matches a hypothesis postulated in 1990 by Dr John Jackson, a U.S. physicist who conducted the first major investigation into the shroud in 1978. Jackson speculated the presence of a faint image on the back surface of the shroud, only in correspondence to the frontal image. The history of the cloth has been steeped in mystery. It has survived several blazes since its existence was first recorded in France in 1357, including a mysterious fire at Turin Cathedral in 1997. BUTLER – It is not a book for the squeamish. But it is a book for those who want to understand fully and exactly, from the perspective of a medical professional, what Jesus Christ gave to humankind through his passion and death. Dr. Gerard Stanley Sr. was a resident in family practice in the early 1980s when he read Dr. William Edwards’ paper, "On the Physical Death of Jesus Christ," in the Journal of the American Medical Association. The paper moved him both as a physician and as a Catholic – what could possibly lead Jesus to suffer some of the most brutal torture any human being could possibly suffer unless he loved us enough to die horribly for us? For years, Dr. Stanley, now in practice in Butler where he is a member of St. Patrick Parish, would lecture on the passion and death of Jesus to small groups. Finally, at the urging of friends, he put his years of research and knowledge into a book. "He Was Crucified," subtitled "Reflections of the Passion of Christ," was published in January by Concordia Publishing House. It is available at the I. Donnelly Co., 6601 Troost in Kansas City; from the publisher at 1-800-325-3040 or online at http://www.cph.org, or through online retailers such as Amazon or Barnes & Noble. "I have a PhD in theology," said his pastor, Father John Bolderson who got the first copy off the press in January. "This is as scholarly a presentation on the crucifixion as I have ever read anywhere." Stanley said it was a book that he had to write. "How could I not write it," he said. "That became the question." Far from a gory rehash, Dr. Stanley writes with precision and plain simple language as he breaks the death of Jesus into four phases – the weakening of his body during the agony in the Garden of Gethsemane, the horrendous scourging at the pillar, the carrying of the cross to Golgotha, and finally, his agonizing death on the cross. "Every time I reflect on Jesus’ passion, I grow in my appreciation for what my Savior endured for me and my sins," Stanley wrote in his introduction. "If you receive insight into Christ’s suffering, then this book has accomplished its purpose. The book is filled with art from ancient to modern that depicts Jesus’ suffering. It is also filled with Scripture, hymns and reflections from great thinkers ranging from Cyril of Alexandria to Martin Luther that were added by the book’s editor, Dr. Kent J. Burreson who sits on the faculty of Concordia Theological Seminary in St. Louis. It is a book, Stanley told The Catholic Key, that is not meant to be read and put aside. "How do you not help spread the word to help shed light on what Jesus went through for us?" he said. Stanley said even depictions of Jesus nailed to the cross don’t fully reflect the agony he suffered. "We always give Jesus a nice clean body, but that’s not what happened," he said. "I guess if that helps us relax and gives us a chance to meditate, then it’s a good thing." But understanding the fullness of Jesus’ suffering is also important, he said. "It’s hard to imagine how people could be so cruel to another human being," he said. "We wouldn’t allow this to happen to an animal." Stanley said that Edwards’ original paper was written to debunk a short-lived heresy floating around at the time that Jesus death was faked and that he was resuscitated, not resurrected, a few days later. But even today, not even with the tools of modern medical technology, could Jesus have survived what he experienced, Stanley said. Stanley said he paid particular attention to Gethsemane because that is an important, yet overlooked, part of the passion story. He pointed to the Gospel of Luke, the physician, who described Jesus sweating profusely, his sweat "like great drops of blood." That is a medical condition called hemohidrosis, a phenomenon so rare that no observer could imagine it, Stanley said. Stanley said the same profuse sweating under intense agony was recorded in the horrific experiments that Nazis performed on concentration camp prisoners. "You ask yourself, what could have been so intense that could have caused this?" Stanley said. "It begs the question: Did Jesus in his final few hours in the garden actually experience what was about to happen?" Stanley said that in his three hours in the garden, Jesus fully experienced everything that was about to happen to him. He went through every stage of grief – denial and the final temptation of the serpent, bargaining with God the Father to remove the burden from him, then finally, with the assistance of an angel sent to strengthen him, acceptance. But by that time, after three hours, the profuse sweating of blood had taken its toll on Jesus’ body, leaving him profoundly weakened, Stanley said. "He surrendered himself with complete understanding of what was going to happen," he said. Following his arrest, Jesus was beaten, tortured and shuttled back and forth between the Roman governor, Pontius Pilate, and Jewish authorities who could not, by Roman law, execute Jesus themselves. Pilate actually wanted Jesus alive, Stanley noted. "Jesus was a disruptive force to the Jewish hierarchy, and anything that was disruptive to the Jewish hierarch was welcomed by Pilate," he said. But the Jewish leaders who wanted Jesus dead prevailed by telling Pilate that Jesus claimed to be the "King of the Jews." "That’s what got him," Stanley said. "Jesus’ claim that he was a ‘god’ would not have been offensive to Pilate. But Pilate didn’t want the word getting back to Rome that he had spared a threat to Rome." Pilate ordered Jesus scourged and crucified. The scourging alone was fatal, especially to a man in Jesus’ weakened condition from Gethsemane, Stanley said. "That was the routine procedure. The condemned were to be scourged before being put on the cross, but they were to die on the cross," he said. Roman scourging caused more than pain, he said. Attached to the whips they used were barbs that ripped off flesh, muscle and even bone. Using the Shroud of Turin as evidence of what a victim of scourging endured, Stanley said that Jesus endured well over 100 strokes. "His flesh and muscle was literally ripped off," Stanley said. "His back, neck, arms, buttocks, anywhere a whip would have hit, was ripped open. Think of the hatred the Romans must have had: ‘Here is your king. We will beat him.’ They beat him so severely that he died rapidly on the cross." But not that rapidly. After crowning him with thorns and opening gashes on his head, the Romans nailed him to the cross with a precision they learned over decades of crucifying their enemies. They were very careful to place the nails in the wrists and ankles that would hold up the weight of a man, yet not rupture vital blood vessels and cause quick death. The crucifixion was all about pain, Stanley said. "Now think back to the Garden of Gethsemane," he said. "Is that enough to ask your Father to take it away?" Bleeding and in anguish from the brutal scourging, the crown of thorns digging dozens of new wounds into his head, Jesus heaved and gasped for every breath he took, his open wounds scraping the rough cross for three solid hours. His internal organs began to fail, Stanley said. His lungs could not exchange oxygen, and carbon dioxide began to build up. His kidneys began to quit. His heart was ready to burst. Any one of a number of causes, including loss of blood and body fluid, was enough to kill. When the Roman centurion delivered the "death thrust" into Jesus side, puncturing his heart, it wasn’t to kill him, but to make certain he was dead, Stanley said. Stanley admitted that as a physician, Jesus’ death was horrifying. But the story does not end there. In his final chapter, Stanley reflects on the triumph over death of the resurrection. It is that miracle of the promise of eternal life that Stanley has also witnessed in his patients as they are facing death. "Part of our job as physicians when we can’t change the outcome is to make patients as comfortable as possible as they die," he said. "They go through it all. First you ask your saints and God the Father for help, then you see that Jesus went through the same thing," Stanley said. "Knowing Jesus went through this and more, there is a comfort there," he said. "They can then die with a peacefulness that you can see. It is just remarkable." Stanley will give a presentation on the suffering of Jesus following the 10 a.m. Mass Feb. 22 at St. Patrick Parish, 400 W. Nursery St., Butler, where he will also sign his book. The following Sunday at 6 p.m. the parish will host a screening of Mel Gibson’s "The Passion of the Christ." 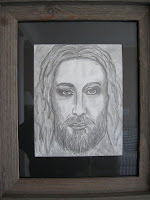 Well since I’m "too Catholic" I’ll just have to go ahead and show you a sketch I did of Jesus, based upon the image on the Shroud of Turin.